The Friday Gentleman’s Game Cup Series rolled onwards last night with three members crossing the 100 picket line and two others coming very close to the milestone. All scoring was led by Swindaman3 who nearly reached the 150 plateau with his 149.95 points and the weekly Gents Game win. 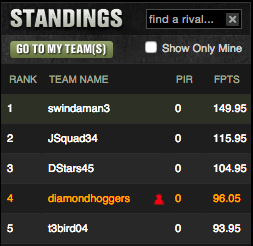 Swindaman3 went with an unconventional play of Melvin Upton Jr. against Wandy Rodriguez, and it paid off in a big way with the lesser Upton brother scoring 20 points. If you had Danny Salazar last night as Swindaman3 did, you probably were in a good position to win money because Mr. Jekyll and Hyde himself threw a gem against the Athletics. Noah Syndergaard and his 42+ points was owned by three owners – but Swindaman3 laid Thor’s effort to waste. Things are very tight in the yearly standings, with just a single point separating our top two contestants and a tie for the bottom between two more, with our own t3bird04 being the meat of this Gentleman’s Game sandwich. It is nice to know you can achieve such a nice score by just picking guys at every position who will offer some scoring – you don’t have to stack to be successful in this game of gentleman, as Swindman3 proved. 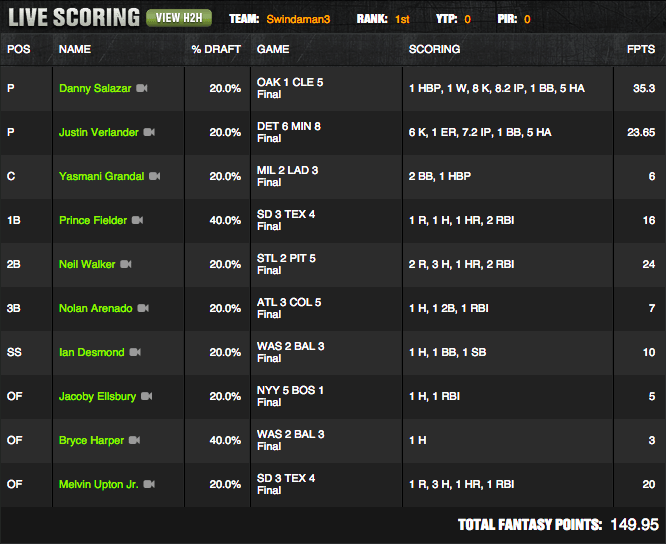 In fact, you can be quite successful at MLB DFS by involving Melvin Upton Jr. and Justin Verlander. It is worth noting that Diamondhoggers used the services of Erasmo Ramirez (aka ‘The Gardener) and these services went to waste. So what will happen next week? Will anyone have the audacity to use Melvin Upton Jr. once again? Will Josh Donaldson and Mitch Moreland decide to take another zero in a matchup that favors them? Will Shin-soo Choo continue to score ‘2’ or ‘3’ like he always does when we look his way? Every man in this contest wants so badly to reach for this brass ring of fantasy glory, but we can only reach for said ring on Friday’s. You must tune in next week to find out how the saga of the gentleman’s game plays out. We are at the All-Star Break and there is still time for salvation, but the sands in the hourglass are running thin.